LONDON--(BUSINESS WIRE)--The global real estate software market is expected to post a CAGR over 8% during the period 2018-2022, according to the latest market research report by Technavio. A key factor driving the growth of the market is increasing middle-class population in developing economies. Economic activities in developing economies such as China, India, and South Africa have led to a rise in per-capita income. The increase in household incomes has led to a rise in property purchase. The rise in the number of first-time property buyers in these countries accelerated the demand for residential properties. Real estate software helps real estate entities in all aspects of real-estate development right from planning designs to the actual sales of properties. In today’s global markets, this software has become vital for property construction. This market research report on the global real estate software market 2018-2022 also provides an analysis of the most important trends expected to impact the market outlook during the forecast period. Technavio classifies an emerging trend as a major factor that has the potential to significantly impact the market and contribute to its growth or decline. Real estate sector lacks transparency. Blockchain can help the real estate sector in increasing transparency. The blockchain technology ensures that every record is encrypted, and the ledger is hackproof. As a result, once the transactions are completed, changes cannot be incorporated. With the help of blockchain real estate transactions, payments can be received instantly even after working hours. The technology eliminates the need for middlemen involved in transactions and ensures smooth and fast transactions. Blockchain helps reduce frauds in the real-estate sector by conducting thorough background checks and is thus expected to boost the growth of the market in the forthcoming years. “Increased household income has led to people spending more on traveling and investing in commercial properties. An increased use of blockchain in real estate management software is seen to protect consumers interests from external factors. Advantages offered by blockchain are likely to cause a shift from traditional methods to blockchain based real estate transactions, which augurs well for the growth of the market during the forecast period,” says a senior analyst at Technavio for research on enterprise application. This market research report segments the global real estate software market by deployment (on-premises, and cloud-based), by end-users (architects and engineers, project managers, and real estate agents) and by geographical regions (APAC, EMEA, and the Americas). The Americas led the market in 2017 with a market share of nearly 43%, followed by EMEA and APAC, respectively. However, during the forecast period, the APAC region is predicted to have the highest incremental growth followed by the EMEA region. Americas is expected to see a commensurate decline in its market share. 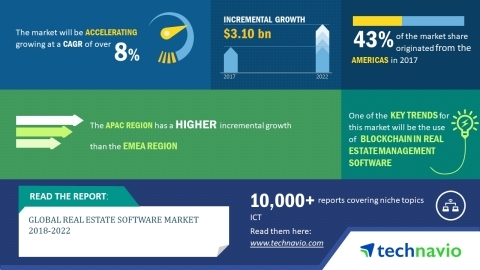 The global real estate software market is expected to post a CAGR over 8% during 2018-2022, according to the latest research report by Technavio.